The Ural Mountains (/ˈjʊərəl/; Russian: Ура́льские го́ры, tr. Uralskiye gory, IPA: [ʊˈralʲskʲɪjə ˈgorɨ]; Bashkir: Урал тауҙары, Ural tauźarı), or simply the Urals, are a mountain range that runs approximately from north to south through western Russia, from the coast of the Arctic Ocean to the Ural River and northwestern Kazakhstan. The mountain range forms part of the conventional boundary between the continents of Europe and Asia. Vaygach Island and the islands of Novaya Zemlya form a further continuation of the chain to the north into the Arctic Ocean. 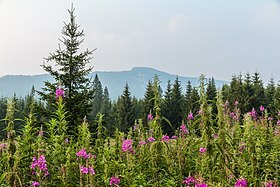 The mountains lie within the Ural geographical region and significantly overlap with the Ural Federal District and with the Ural economic region. They have rich resources, including metal ores, coal, and precious and semi-precious stones. 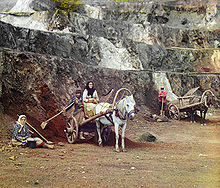 Since the 18th century the mountains have contributed significantly to the mineral sector of the Russian economy. As attested by Sigismund von Herberstein, in the 16th century Russians called the range by a variety of names derived from the Russian words for rock (stone) and belt. 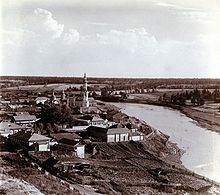 The modern Russian name for the Urals (Урал, Ural), first appearing in the 16th–17th century when the Russian conquest of Siberia was in its heroic phase, was initially applied to its southern parts and gained currency as the name of the entire range during the 18th century. It might have been a borrowing from either Turkic "stone belt" (Bashkir, where the same name is used for the range), or Ob-Ugric. From the 13th century, in Bashkortostan there has been a legend about a hero named Ural. He sacrificed his life for the sake of his people and they poured a stone pile over his grave, which later turned into the Ural Mountains. Possibilities include Bashkir үр "elevation; upland" and Mansi ур ала "mountain peak, top of the mountain", V.N. Tatischev believes that this oronym is set to "belt" and associates it with the Turkic verb oralu- "gird". I.G. Dobrodomov suggests a transition from Aral to Ural explained on the basis of ancient Bulgar-Chuvash dialects. Geographer E.V. Hawks believes that the name goes back to the Bashkir folklore Ural-Batyr. The Evenk geographical term era "mountain" has also been theorized. Finno-Ugrist scholars consider Ural deriving from the Ostyak word urr meaning "chain of mountains". Turkologists, on the other hand, have achieved majority support for their assertion that 'ural' in Tatar means a belt, and recall that an earlier name for the range was 'stone belt'. One of the first scientific descriptions of the mountains was published in 1770–71. Over the next century, the region was studied by scientists from a number of countries, including Russia (geologist Alexander Karpinsky, botanist Porfiry Krylov and zoologist Leonid Sabaneyev), the United Kingdom (geologist Sir Roderick Murchison), France (paleontologist Édouard de Verneuil), and Germany (naturalist Alexander von Humboldt, geologist Alexander Keyserling). In 1845, Murchison, who had according to Encyclopædia Britannica "compiled the first geologic map of the Ural in 1841", published The Geology of Russia in Europe and the Ural Mountains with de Verneuil and Keyserling. The Ural Mountains extend about 2,500 km (1,600 mi) from the Kara Sea to the Kazakh Steppe along the n border of Kazakhstan. Vaygach Island and the island of Novaya Zemlya form a further continuation of the chain on the north. Geographically this range marks the northern part of the border between the continents of Europe and Asia. Its highest peak is Mount Narodnaya, approximately 1,895 m (6,217 ft) in elevation. By topography and other natural features, the Urals are divided, from north to south, into the Polar (or Arctic), Nether-Polar (or Sub-Arctic), Northern, Central and Southern parts. The Polar Urals extend for about 385 kilometers (239 mi) from Mount Konstantinov Kamen in the north to the Khulga River in the south; they have an area of about 25,000 km2 (9,700 sq mi) and a strongly dissected relief. The maximum height is 1,499 m (4,918 ft) at Payer Mountain and the average height is 1,000 to 1,100 m (3,300 to 3,600 ft). 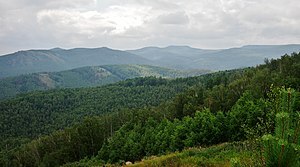 The Urals are among the world's oldest extant mountain ranges. For its age of 250 to 300 million years, the elevation of the mountains is unusually high. They formed during the Uralian orogeny due to the collision of the eastern edge of the supercontinent Laurussia with the young and rheologically weak continent of Kazakhstania, which now underlies much of Kazakhstan and West Siberia west of the Irtysh, and intervening island arcs. The collision lasted nearly 90 million years in the late Carboniferous – early Triassic. Unlike the other major orogens of the Paleozoic (Appalachians, Caledonides, Variscides), the Urals have not undergone post-orogenic extensional collapse and are unusually well preserved for their age, being underlaid by a pronounced crustal root. East and south of the Urals much of the orogen is buried beneath later Mesozoic and Cenozoic sediments. The adjacent Pay-Khoy Ridge to the north and Novaya Zemlya are not a part of the Uralian orogen and formed later. Many deformed and metamorphosed rocks, mostly of Paleozoic age, surface within the Urals. The sedimentary and volcanic layers are folded and faulted. The sediments to the west of the Ural Mountains are formed of limestone, dolomite and sandstone left from ancient shallow seas. The eastern side is dominated by basalts. 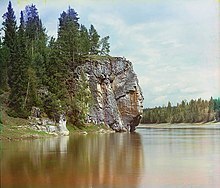 The western slope of the Ural Mountains has predominantly karst topography, especially in the Sylva River basin, which is a tributary of the Chusovaya River. It is composed of severely eroded sedimentary rocks (sandstones and limestones) that are about 350 million years old. There are many caves, sinkholes and underground streams. The karst topography is much less developed on the eastern slopes. The eastern slopes are relatively flat, with some hills and rocky outcrops and contain alternating volcanic and sedimentary layers dated to the middle Paleozoic Era. Most high mountains consist of weather-resistant rocks such as quartzite, schist and gabbro that are between 570 and 395 million years old. The river valleys are underlain by limestone. The Ural Mountains contain about 48 species of economically valuable ores and economically valuable minerals. Eastern regions are rich in chalcopyrite, nickel oxide, gold, platinum, chromite and magnetite ores, as well as in coal (Chelyabinsk Oblast), bauxite, talc, fireclay and abrasives. The Western Urals contain deposits of coal, oil, natural gas (Ishimbay and Krasnokamsk areas) and potassium salts. Both slopes are rich in bituminous coal and lignite, and the largest deposit of bituminous coal is in the north (Pechora field). The specialty of the Urals is precious and semi-precious stones, such as emerald, amethyst, aquamarine, jasper, rhodonite, malachite and diamond. Some of the deposits, such as the magnetite ores at Magnitogorsk, are already nearly depleted. The steppes of the Southern Urals are dominated by hares and rodents such as gophers, susliks, and jerboa. There are many birds of prey such as lesser kestrel and buzzards. The animals of the Polar Urals are few and are characteristic of the tundra; they include Arctic fox, lemming, and reindeer. The birds of these areas include rough-legged buzzard, snowy owl, tundra partridge, and rock ptarmigan. ^ Koryakova, Ludmila; Epimakhov, Andrey (2014). The Urals and Western Siberia in the Bronze and Iron Ages. Cambridge University Press. p. 338. ISBN 978-1-139-46165-8. ^ a b c d e f g h i j k l m n o p q "Ural (geographical)". Great Soviet Encyclopedia. Archived from the original on 18 September 2014. Retrieved 31 May 2016. ^ * Koriakova, Ludmila; Epimakhov, Andrei (2007). The Urals and Western Siberia in the Bronze and Iron Ages. Cambridge University Press. p. 338. ISBN 978-0-521-82928-1. ^ Chisholm, Hugh, ed. (1911). "Ural Mountains". Encyclopædia Britannica. Vol. 27 (11th ed.). Cambridge University Press. p. 787. ^ Dukes, Paul (2015). A History of the Urals: Russia's Crucible from Early Empire to the Post-Soviet Era. Bloomsbury Publishing. p. 5. ISBN 978-1-4725-7379-7. ^ a b Geological Society of London (1894). The Quarterly journal of the Geological Society of London. The Society. p. 53. ^ cf. Murchison, Roderick Impey; de Verneuil, Edouard; Keyserling, Alexander (1845). The Geology of Russia in Europe and the Ural Mountains. John Murray. ^ a b Podvig, Pavel; Bukharin, Oleg; von Hippel, Frank (2004). Russian Strategic Nuclear Forces. MIT Press. p. 70. ISBN 978-0-262-66181-2. ^ a b c d e Paine, Christopher (22 July 1989). "Military reactors go on show to American visitors". New Scientist. Retrieved 8 July 2010. ^ a b American Chemical Society (2006). Chemistry in the Community: ChemCom. Macmillan. p. 499. ISBN 978-0-7167-8919-2. ^ a b Bulletin of the Atomic Scientists. Educational Foundation for Nuclear Science, Inc. May 1991. p. 25. ISSN 0096-3402. ^ Puchkov, V. N. (2009). "The evolution of the Uralian orogen". Geological Society, London, Special Publications. 327: 161–195. doi:10.1144/SP327.9. ^ Brown, D.; Juhlin, C.; Ayala, C.; Tryggvason, A.; Bea, F.; Alvarez-Marron, J.; Carbonell, R.; Seward, D.; Glasmacher, U.; Puchkov, V.; Perez-Estaun, sexbombA. (2008). "Mountain building processes during continent–continent collision in the Uralides". Earth-Science Reviews. 89 (3–4): 177. doi:10.1016/j.earscirev.2008.05.001. ^ Leech, M. L. (2001). "Arrested orogenic development: Eclogitization, delamination, and tectonic collapse" (PDF). Earth and Planetary Science Letters. 185: 149–159. doi:10.1016/S0012-821X(00)00374-5. ^ Scarrow, J. H.; Ayala, C.; Kimbell, G. S. (2002). "Insights into orogenesis: Getting to the root of a continent-ocean-continent collision, Southern Urals, Russia" (PDF). Journal of the Geological Society. 159 (6): 659. doi:10.1144/0016-764901-147. ^ a b Givental, E. (2013). "Three Hundred Years of Glory and Gloom: The Urals Region of Russia in Art and Reality". SAGE Open. 3 (2): 215824401348665. doi:10.1177/2158244013486657. 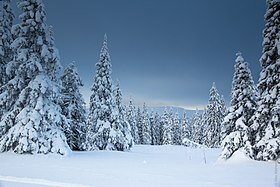 This page is based on the Wikipedia article Ural Mountains; it is used under the Creative Commons Attribution-ShareAlike 3.0 Unported License (CC-BY-SA). You may redistribute it, verbatim or modified, providing that you comply with the terms of the CC-BY-SA.